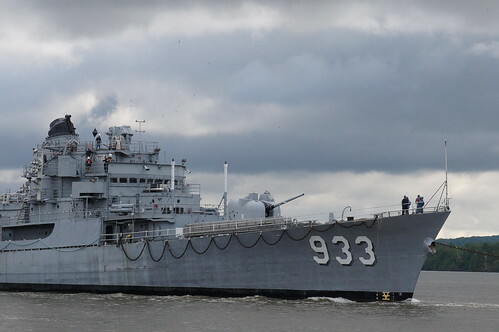 The old Navy ship Barry (DD-93), long a fixture at the US Navy Museum in Washington DC as a display ship, departed Navy Yard this morning for a final voyage to the Philadelphia NISMF for disposal. 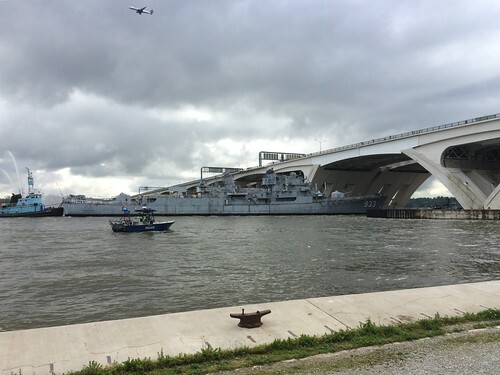 I didn’t even know the ship was leaving till Steven Schwark posted about it, and Joseph Gruber suggested I go down to the Woodrow Wilson Bridge to catch it — so we drove over to Jones Point Park with plenty of time to catch the ship’s passage under the bridge. (I never did get to board the Barry, but I know someone who served aboard it in the Navy: Richard Hay (aka @WinObs), who I met at the NASA Juno Tweetup.) I was glad to at least see the ship sail by as she departed DC. More photos in my “Barry Departure” photo album.